When Edward Lear was a teenager, he and his elder sister moved from their childhood home in the suburbs of London to the center of the City. Lear was looking for a way to use his artistic skills to make money, so he turned to the increasing number of naturalists who were classifying birds and animals, and to the artists who drew them. At the time, the British public was fascinated by the animals from their “exotic” colonized countries in all corners of the Empire, and so prints and books depicting these creatures were in high demand. Lear began to utilize the newly created London Zoological Gardens, which were designed to house animals and birds from all over the British Empire. Though closed to the public, Lear somehow managed to garner permission from the President of the Zoological Society to enter the Gardens to sketch. Lear started an apprenticeship with Prideaux Selby (a scientific illustrator), began taking commissions, and then eventually, in 1830, decided to embark on his own project in between these assignments. He decided to create a set of prints devoted to parrots, his favorite bird to draw. Lear acquired an impressive list of 125 subscribers, one of them being the Queen-Consort at the time, Adelaide. Though a daunting job, Lear managed to forge ahead, completing his forty-two sketches in ink, graphite, and watercolor, before transferring the images to lithographs for the book. His lithographs were released in small batches and were very popular. After the release of the first two plates, Lear was inducted into the Linnean Society, a great honor for a scientific illustrator. 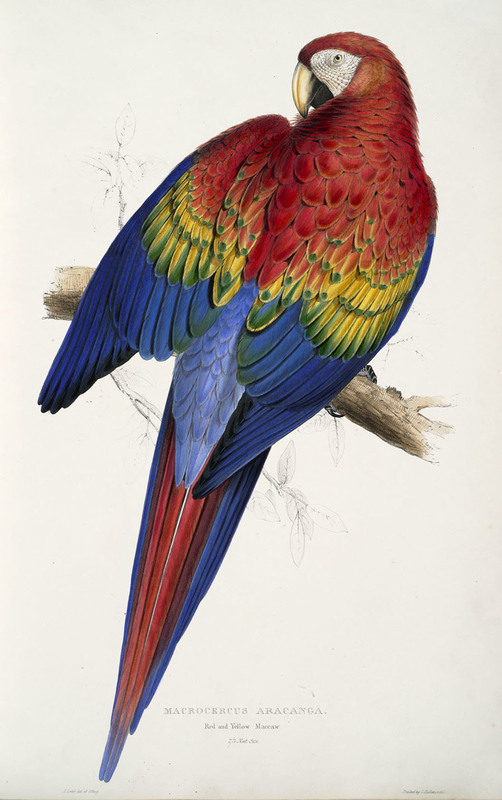 This image of a red and yellow macaw featured in his final batch of lithographs from 1832 which he encouraged his subscribers to bind into a complete book. Lear was only nineteen years old by the time his Illustrations of the family of Psittacidae or parrots was complete.